RAQUEL JIMENEZ, researcher in Music Archaeology at the Departamento de Historias y CC de la Música of the University of Valladolid. 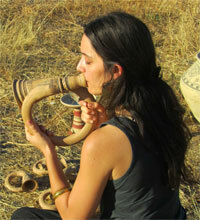 Her research focus are organological and iconographical remains of the Iberian Peninsula, and for the ARCHÆOMUSICA exhibition, will work in the reconstruction of Iron Age clay aerophones and medieval clay drums. Together with Cajsa Lund, she will also create education materials for the EMAP.